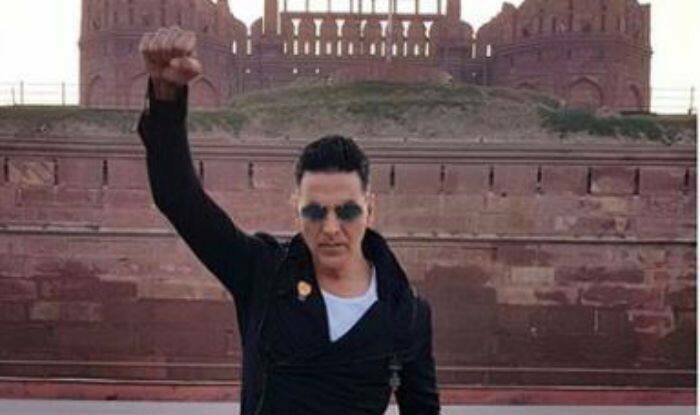 Akshay Kumar and Parineeti Chopra were recently in Delhi for their upcoming film Kesari’s promotions. Akshay plays the role of Havildar Ishar Singh, a Sikh soldier who valiantly fought the Battle of Saragarhi with a chakram (a circular weapon) in one hand and a glinting sword in the other. Parineeti plays his love interest in the film. During the promotions, both the stars decided to spend a day with BSF jawans in Delhi. Akshay and Parineeti had a lot of fun as they danced along with BSF jawans on the song ‘Sanu Kehndi’ from the film. Now, the video has circulated around social media and are going viral on the internet. In the video, Akshat is showcasing his killer dancing steps while Parineeti is seen standing and rooting for her co-star. Earlier, another video from the promotions of the film in Delhi took the internet by storm. In the video, Akshay can be seen sitting on top of the car and waving to the crowd surrounded around him. The crowd went gaga over seeing their favourite actor. Since the trailer of the film has been released, it created a lot of buzz. The trailer received positive reviews and their fans can’t wait for the film to release. Earlier Parineeti spoke about grabbing the opportunity to do the film and told Mumbai Mirror, “Kesari is about the boys. Of course, my character doesn’t figure in the battle. As a part of the love story in the film, I play Akshay’s deceased wife. Havildar Ishar Singh thinks about her and their love at crucial moments of his life. Fifty years from now, I can proudly say that Kesari is a part of my filmography”. Kesari is a period drama which is based on the Battle of Saragarhi, one of the bravest battles India had ever fought. Directed by Anurag Singh, the film is all set to hit theatres on March 21.